I like the basket you have. If you have a nice purse or something you don't want to shove in a pannier, it helps show it off :-)I have nice big panniers that I found at a thrift store a few years ago. I could fit so many groceries in them! They got a hole in the bottom & I got a pair of Trek ones, which are smaller but more durable. Hopefully you can find maybe a used pannier that would be cheaper then buying them new. Second hand panniers are a great idea! I'll have to see if I can find some, it would be a much better option than purchasing new. I almost bought a pannier rack recently that was going cheap in a bike store - because I still miss my panniers that were loaned and never returned - I rode a lot when I had them and they were great - I think a basket is really cool - there are green ones I would love to get - and a good way to start using your bike for groceries - now I think maybe I need a basket for quick trips to the shops because I have had vegies chopped up in the wheels when trying to have bags hanging off my handlebars! 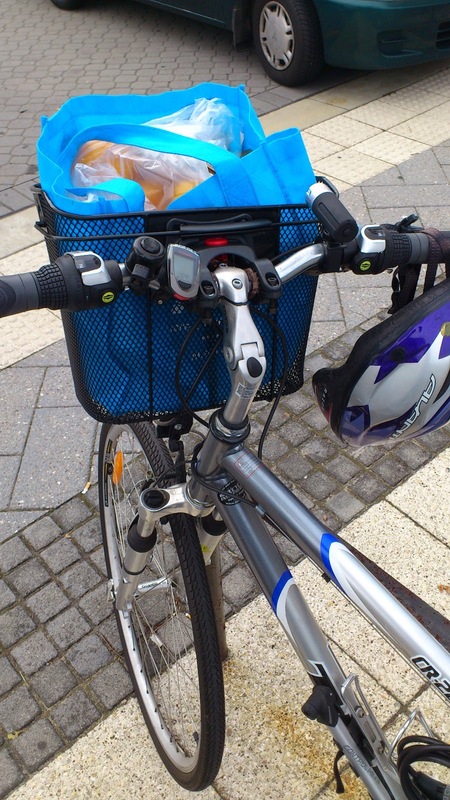 When looking at panniers and their prices, I felt an extra wave of sympathy for your borrowed and not returned ones! Very rude of the person in question. A green basket does sound very appropriate as an alternative though - and I can attest it does wonders for avoiding fruit and veg jarring against the wheels! That was the exact problem I encountered with bags off the handlebars. That is the most adorable thing EVER. I SO wish I lived somewhere where I could bike to the store. And then, if I did, I wish I wasn't far too lazy and uncoordinated to do such a thing. It does feel nicely traditional - although as you say, it's strange in some ways that we've moved away from it and now it is tradition! Perhaps bikes and baskets will come back in fashion. way to go!!! okay, i totally love the feeling of making/doing something like this urself...sort of jimmy-rigging it. i'm a total frugal chick and have found that duct tape can achieve almost anything! ;) lol....that said, i think ur bike looks AWESOME, heck maybe u can start a trend with other people using similar baskets. have a great night!! Haha, duct tape certainly is a versatile accessory :) And I love the bike basket as a trend idea - probably not to be started by me, but if enough people use them maybe it will become a rediscovered way of shopping. The basket sounds like a great option for infrequent trips! I commuted to work by bike for a couple of years as it was only a 20 minute cycle and really loved it. 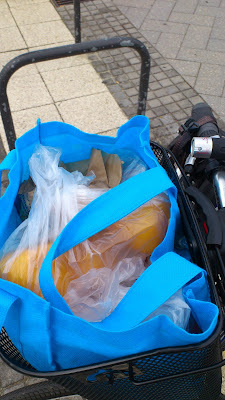 I don't get on my bike much these days as there are shops within walking distance which is great for small shopping trips when you don't need to carry much. Walking is a bit simpler for small shopping trips - no helmet and bike lock to worry about aside from anything else! A 20 minute cycle commute sounds lovely though, I imagine one would miss it if you'd had that for a while and then changed job / location.